Continuing his Lenten sermon series, Rev. Grady Mosley points out the verdict is already given to us. God has illuminated the world to show us the way to Him. As Rev. Grady Mosley continues with his “Great Debate” series, we examine how divisiveness affects our relationships with each other. In his Lenten series, Rev. Grady Mosley takes on two personas in a debate of the power and primacy of Christ. He encourages us to remain faithful, trusting in Christ. Christ remains steadfast throughout all of life’s challenges. In his Lenten series, Rev. Grady Mosley takes on two personas in a debate of the power and primacy of Christ. Rev. Grady Mosley returns to the Prophet Malachi for revealing the characteristic of God’s covenants. Receiving the blessing of God’s covenants requires our trust and faithfulness. The Lord has always led before His people. Rev. 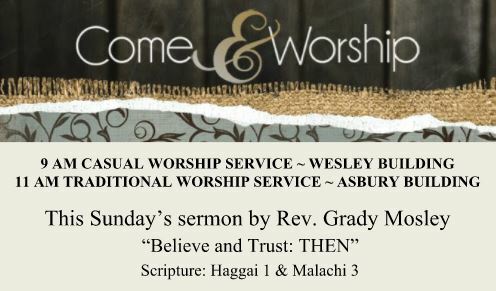 Grady Mosley reminds us we can believe and trust Him to meet our needs. https://madisonfumc.com/wp-content/uploads/trust-believe.jpg 714 1920 MadisonFUMC Admin http://madisonfumc.com/wp-content/uploads/2017/07/logo.png MadisonFUMC Admin2018-02-04 15:22:082018-02-04 15:23:07Sunday, February 4, 2018, 9:00 AM “Believe and Trust: WHEN"
As servants of Christ, we are expected to be dependable and trustworthy. Rev. Grady Mosley offers points to consider as we strive to enrich our Christian walk. https://madisonfumc.com/wp-content/uploads/believetrust.jpg 714 1920 MadisonFUMC Admin http://madisonfumc.com/wp-content/uploads/2017/07/logo.png MadisonFUMC Admin2018-01-28 15:12:432018-01-28 16:09:54Sunday, January 28, 2018, 9:00 AM “Believe and Trust"
To raise awareness of human trafficking issues, Rev. Grady Mosley reminds us of one of Jesus’ Priorities: To accept children as precious.